While this should come as a surprise to absolutely no one, it’s the first time I’ve seen Delta officially refer to Austin as a focus city. That’s more than just a destination they serve, generally with flights to their various hubs. Instead it suggests they’ll develop additional non-hub direct routes as well. That differs from a hub both in size (it will never become as large an operation as Minneapolis, let alone Atlanta) and also that they’re unlikely to market it as a primary place for many connections. Instead they’ll make a play for Austin’s business customers by offering them flights to the cities they want to travel to. Current Delta focus cities include Raleigh-Durham, Boston, and Cincinnati. Currently Southwest Airlines is the largest carrier at the airport with over a third of passenger traffic. American Airlines is second with half the passengers Southwest carries. United is third, Delta fourth, and JetBlue fifth (way behind). Austin is the fastest growing airport in the country right now based on seat capacity in the coming quarter. The airport currently has 24 gates total in the main terminal. They’re in the midst of a project to add 9 gates. (This doesn’t count the ‘South Terminal’ for low cost carrier operations — currently Allegiant and Via Air.) Gate re-numbering will begin this summer to prepare for this 38% growth. American Airlines and United both operate clubs at the airport. Delta plans to open a club at the airport next year with an outdoor patio (Sky Deck). Delta’s club will be located in the new section of the airport and its gates will be nearby. Additional gates from the expansion should allow Delta to perhaps double its operation. There are also shared gates capable of international. For all those Delta customers who will soon enough be visiting Austin, we’re more than just great barbecue (although there’s nothing in the world like Central Texas barbecue). The airport itself even has improving concession options — there’s outposts of Second Bar + Kitchen, Peached Tortilla, and soon enough a Tacodeli. American Airlines has been the largest full service carrier in the city. It has lucrative corporate business, and that’s helped make the British Airways London Heathrow flight a success (what started as a 787 is a 747 this summer). But they fly to their own hubs only. Philadelphia, Phoenix, and Miami have frequently been served with regional jets. There’s an opportunity to disrupt American’s cozy piece of the market, and Delta is coming. It wasn’t that long ago when Seattle and Los Angeles were focus cities. Boston is for all intents and purposes a hub now. San Francisco must be a focus city too, officially or unofficially. …the next trip in mid-October is already booked on Delta, too! Austin, like RDU, has a diverse economy featuring corporations, academia & government to make it worthwhile to offer nonstops to key cities outside of the hub & spoke ecosystem – especially with those shiny new CS100s (or A210s). And Delta is now evolving into a hybrid business model that’s better adapted to the industry’s desperate lack of competition (more commonly known as an oligopoly) where cities with a diverse economic base that have a higher percentage of educated, affluent professionals. Plus, if Amazon picks Austin for its HQ2 (Apple’s defacto HQ2 is already there), then Delta will really be in a good position to leverage its new hub/gateway in Seattle with its future “focus city” in Austin to win the lion’s share of lucrative corporate contracts for the 50,000 or so employees Amazon says it needs for its future HQ2! SFO has been a large UA fortress hub for quite a while. The only thing that has stopped me from seriously considering AUS as a place to live is that it is hubless. If that changes (and I think it will with the influx of new people) in the next few years it becomes very tempting! I know what I will be using. So will AUS-AMS seasonal be announced for summer 2019? It seems like the SXSW flights were a test run and they will have the SkyClub with SkyDeck open by then. As Gary noted, a Focus City is different than a hub. I’m familiar with Delta’s RDU Focus City because I have family there, and either fly there and back (from NYC) with some regularity, or help out family members when they’re planning their trips. So, apart from Delta simply being the LEAST worst of our oligopolist airlines, or as I prefer to call it, “Best at Being Worst (and getting away with it)”, Delta also gets most of the bookings (followed by Southwest) at RDU because it does offer more nonstop destinations than other airlines at RDU that allows for bypassing hubs. But other than NYC, where Delta has two hubs with 200+ flights per day (JFK & LGA), and offers a very robust schedule throughout the day to all three major airports, or Atlanta, which of course, is also its largest of any airline in the world hub, the frequencies of nonstops to other destinations is far more limited than what one has at true hubs. 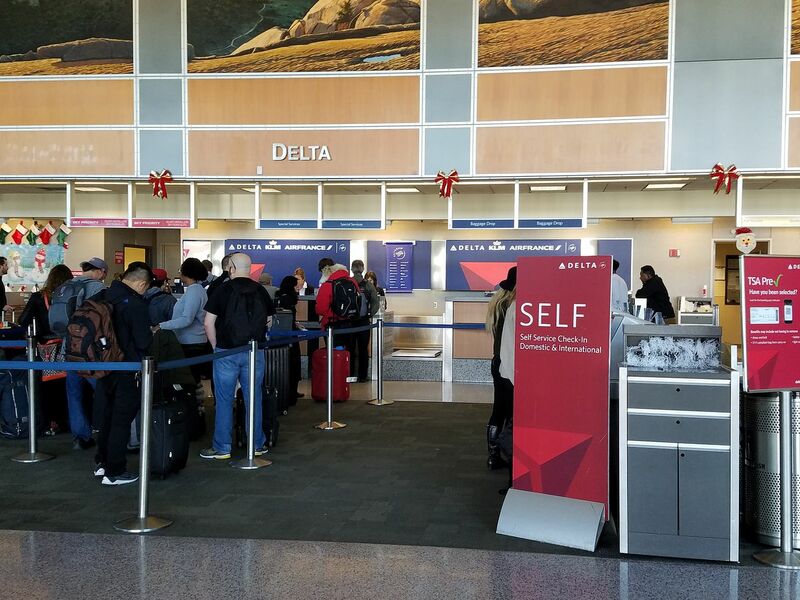 For example, Orlando is two or three nonstops on 76-seat Delta-connection flights (that often are very expensive). Nonstops to LAX or other west coast cities are typically once per day, etc. So, yes, the range of destinations served nonstop at RDU for Delta is great, and the airline has done a good job of filling in the void at a city that in the past was the hub for American Airlines, and after American, the second iteration of one of the earliest, and for a while, a successful deregulation baby, Midway (the first version was based at Midway Airport in Chicago, and offered a low fare-higher value service that actually was pretty good, which I flew when I lived in Chicago back in the 1980s) when Midway 2.0 tried to make a successful reincarnation at RDU. But make no mistake, Delta’s ops at RDU now are nowhere near as robust as American’s, or even the much smaller Midway 2.0’s were. So, if it’s a true hub, with a wide expanse of domestic and international destinations served nonstop, with a robust schedule throughout the day for domestic ops, that’s NOT what Delta has at RDU, and seeing as that city is more likely to be the model for Austin instead of say, Boston, where Delta is seeking to inhibit the now dominant Jetblue there (JetBlue is Delta’s biggest competitor on the NYC and points east side of the Hudson River so keeping Jetblue in check in Boston also helps to inhibit Jetblue’s resources to expand in NYC), then Austin, even as a Delta Focus City may not ever offer the type of benefits available to corporations that require ready access for air travel that is only found in those cities that still have bona fide hubs now that industry concentration has eliminated cities that used to be major airline hubs like St. Louis, Pittsburgh, RDU, Cincinnati, Cleveland or Memphis. I use the Austin airport weekly. Even with 9 additional gates, it is already overloaded. The concessions are always packed. Parking is an issue. This will make AUS worse. Went to Austin for a bachelor party in April. The “locals” (many of whom moved to Austin in the last 5 years) were downright hostile and the city was overrated. It was an overgrown, less interesting Nashville (which itself is now becoming overgrown). Also at 7am Sunday there were ZERO places within a 7-8 minute walk of my gate that had espresso drinks. One newstand had drip coffee out of a Bunn dispenser that was who knows how old. how exactly is SFO considered “focus city” for DL ? the only thing i can count is seasonal to HNL ? @ Dave : i wouldn’t call UA SFO “fortress” considering they’re less than 50% market share just counting SFO, and even lower when combining all 3 Bay Area airports. @ Howard Miller : i think many have over-estimated the chances of AUS or RDU for Amazon HQ2 just because of their recent growth. They’re both still a metro with ~2mil people, and AUS, even with gate expansion, will still be thin on air routes offering due to the fragmented nature of it. My personal guess for HQ2 is Northern Virginia, where blank slate open land is plenty but with a very comprehensive road / air / rail infrastructure is already in place. Maybe we’re both wrong. As for DL, their hardest challenge of a focus city is that for whatever WN / AA / UA can’t offer via the nonstops, they have a large operation just a tiny hop away at DAL / DFW / IAH, particularly in the DFW case, a super massive one. I also read this as a telltale sign the Amazon has chosen AUS for HQ2. An AUS-SFO or AUS-SJC nonstop would be a welcome addition. They’ve got to be losing a ton of business right now to UA. SAN would be great, too. Connecting through SJC or LAX is a pain. @ henry LAX — Regardless of DL’s market share in BOS, the city is undeniably a focus city for the airline. Consider all of the non-hub routes they serve: AUS, BDA, CUN, FLL, LAS, LAX, MBJ, MCO, PBI, PUJ, RDU, RSW, SFO, and TPA, not to mention AMS, CDG, DUB, and LHR. Is there no longer a AUS-SJC AA flight? I used to take that one all the time. Focus cities generally mean 60 to 100 daily flights noting Las Vegas Raleigh-Durham Orlando Boston all Focus cities for Delta. MEM and CVG are in that fold due to downsizing. @Justin. I’m sorry you felt mistreated in Austin. Could it be that many city dwellers are transplants from less hospitable cities? HOWEVER, I do agree with you, Austin is overrated and it is also over-hyped. When I moved to Austin there were few nonstop flights to anywhere except Dallas and Houston (LBJ had his Braniff run to DC) as I recall. Muse Air started nonstops to LAX as did Continental in the early 80’s. Parking was still free in front of the terminal at Robert Mueller Airport. Houses were affordable, taxes were low, and entertainment was good and inexpensive. I purchased a vacant lot in Westlake area, just west of downtown Austin in 1997 (20 years earlier my first home was $45,000 in Austin) for $40,000. The City of Austin now appraises that dirt, and just the dirt, at $450,000!!! (A 50×125’ Lot). Taxes forced me to sell. Had my income increased 10 fold it wouldn’t have been a problem. It didn’t and it was. Yes Justin, Austin is overrated and it is overpriced. Sadly. @Justin. BTW. I hope you were able to go to the Broken Spoke and take dance CW dance lesson. It’s a fun crowd. It is perhaps the last remaining venue of the Austin that most of us loved.